A statue of Confederate Gen. Nathan Bedford Forrest along Interstate 65 in Nashville, 1998. Photo by Mark Humphrey/Assocaited Press. To better understand the historical and contemporary context of last week’s drama in New Orleans over de-Confederatizing the city’s public landscape, it might be helpful to shift our gaze from the banks of the Mississippi to the banks of the Tigris. It may seem strange to compare Confederate statuary erected in the late-nineteenth and early twentieth-century South to the self-aggrandizing monuments built by former Iraqi strongman Saddam Hussein. But despite the vast differences in time, geography, and culture, there is a certain symmetry between Saddam’s attempt to unite Iraqis by forging a revisionist ethno-nationalist history and equating his exploits with those of ancient Babylonian rulers and the strategy of postbellum Southern leaders, who sought to instill a sense of nationalistic pride and purpose among white Southerners by rallying them around a glorious if illusory past. Like the some 680 other monuments still scattered across the Confederate and border states, those in New Orleans were meant to reaffirm the nobility and legitimacy of the “Lost Cause” of Southern independence and justify efforts to roll back the challenges to white supremacy posed by emancipation and so-called Radical Reconstruction. After the overthrow of Reconstruction in 1877, the Lost Cause ethos quickly gained a firm grip on the Southern white psyche. Not only did it ascribe the North’s victory solely to its overwhelming advantages in numbers and firepower, which had simply been too much even for the supposedly superior courage and dedication of the South’s fighting men, but it offered a none-too-subtle suggestion that if white Southerners remained true to the ideals and racial foundations of the Lost Cause, its aims might yet be regained. For generations after the Civil War, Southern white politicians intent on denying blacks their political, legal, and civil rights tirelessly invoked the seductive imagery of the Lost Cause that was embedded in the profusion of Confederate monuments and memorials that fairly blanketed the region’s landscape by 1920. The move to enshrine the Lost Cause had frequently gone hand-in-hand with campaigns for segregation and disfranchisement that, replete with incendiary rhetoric, more than once fueled outbreaks of mass violence against blacks. No white leader better illustrated this pernicious fusion of manipulated memory and racial persecution than ex-Confederate and former North Carolina congressman Alfred Moore Waddell. Waddell worked vigorously in conjunction with women’s memorialist groups to secure public monuments to the state’s “fallen sons,” while warning that the only real means of preserving their heroic legacy was denying black men the vote even if “we have to choke the Cape Fear [River] with carcasses”—words that foretold Waddell’s role as the principal instigator of the infamous Wilmington, N.C., riot of 1898, which left at least two dozen blacks dead. When the Civil Rights era finally brought the formal legal demise of racially oppressive and discriminatory Jim Crow policies, it was not surprising that white Southerners who could not accept this outcome chose to cloak themselves in the Confederate flag, and not only hold rallies at the base of Confederate monuments but even erect a few more of them. Even among white Southerners who did accept these advances in black rights, there was a reluctance to go cold turkey on their allegiance to the Lost Cause ethos, lest they effectively surrender what had long defined their cultural identity. But over the last 60 years, the insistence that continued affinity for Confederate symbols could be grounded in “heritage” rather than “hate” finally became blatantly untenable. Rebel flags and the Confederate monuments haunted the grounds of courthouses where the 1955 trial of the murderers of Emmett Till and the 1964 trial of the slayers of four civil rights workers in Philadelphia, Mississippi took place. By 2015, when the grisly slaughter of nine black parishioners occurred in Charleston, South Carolina, Lost Cause iconography and paraphernalia had become a constant thread in a lengthy but tightly interwoven tapestry of racial hatred and injustice. The Charleston massacre forced many white Southerners at long last to weigh the abstractness of heritage against the concreteness of hate, leaving them little choice to withdraw, however grudgingly at first, from the active battle over Confederate symbols, largely leaving the field to an outnumbered, under-resourced minority for whom white privilege was all that was left of their identity to defend. Perhaps that is why, for all the reported death threats and precautionary measures that marked last week’s events in New Orleans, from the outset, the proceedings gave off more than a whiff of a fait accompli. It is particularly noteworthy that the removal of the first three monuments was accomplished in the dark semi-secrecy of night. Yet the fourth and most significant extraction, that of a likeness Gen. Robert Edward Lee, who until recently had ranked as a national as well as Southern icon, came in broad daylight and on a pre-announced schedule. Iraqi civilians and U.S. soldiers pull down a statute of Saddam Hussein in Baghdad, April 9, 2003. Photo by Jerome Delay/Associated Press. The decision to remove Lee’s statue in New Orleans actually seems less bold and definitive than one in Charlottesville, scarcely 100 miles southwest of his Virginia birthplace, where torch-bearing opponents of the move gathered recently to hear white nationalist Richard Spencer, sparking a candlelight counter protest in which a “Black Lives Matter” banner was laid at the statue’s base. 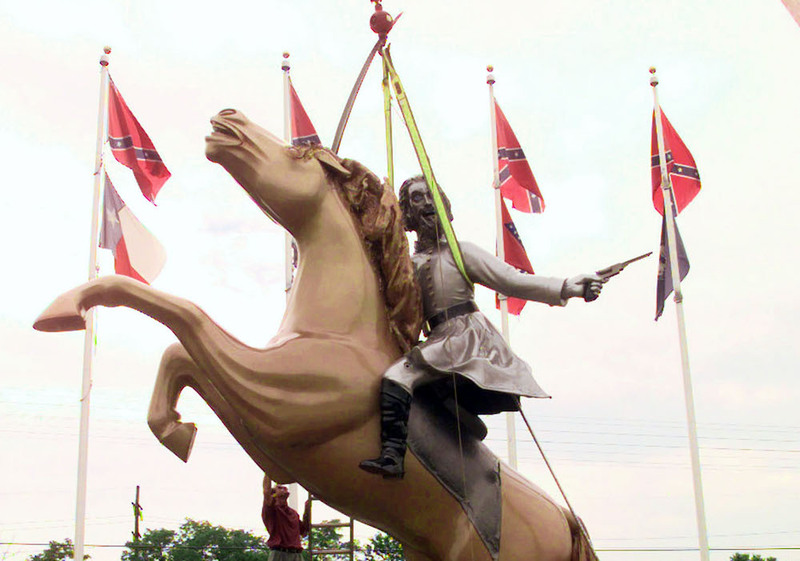 Legal action has guaranteed that the statue will stay put for six months, but if the ultimate failure of efforts to block the removal in New Orleans is any guide, General Lee and his storied mount, Traveler, will soon be on the move in Charlottesville as well. There is further reason to suspect that, at long last, the days of Confederate monuments dominating so many high-profile public spaces in the South may be numbered. Since the Charleston killings two years ago, at least 60 publicly sanctioned Confederate monuments and memorials have reportedly been relocated or removed. Confederate Memorial Day is no longer observed as such in Georgia, and the holiday is under fire in Arkansas and other states as well. There will be rear-guard counteroffensives, to be sure, as attention-seeking legislators seek to reinstitute Confederate holidays or impose legal restrictions on the removal of Confederate monuments, but the broad sense that symbolic tributes to the Confederacy will soon be much less central to Southern culture is hard to shake. If this protracted and often agonizing process has triggered a certain splintering of Southern white identity, then it is a small price to pay, compared to the benefits of forging a more just and inclusive society. But there remains the question of what to do with all of these statues. And it is here that Iraq’s example is both instructive and cautionary. Much like resurgent Southern whites in the wake of Reconstruction, when Saddam Hussein’s Baathist Party came to power in Iraq in 1968, he tried to instill a sense of national pride and identity in his subjects by deliberately glorifying (and embellishing) Iraq’s historical achievements. He demanded that writers and visual artists present positive and compelling representations of Iraq’s past, stretching back all the way to ancient Mesopotamia, complemented by a variety of overpowering monuments such as the Arc of Triumph, which featured gigantic hands holding swords. This new public landscape was meant to instill nationalistic fervor and secure support, or at least acquiescence, to Saddam’s brutal and reckless leadership. Like Saddam’s memorials, Confederate monuments may no longer be acceptable as public historical symbols, but they nonetheless retain a distinct and indelible value as historical artifacts. 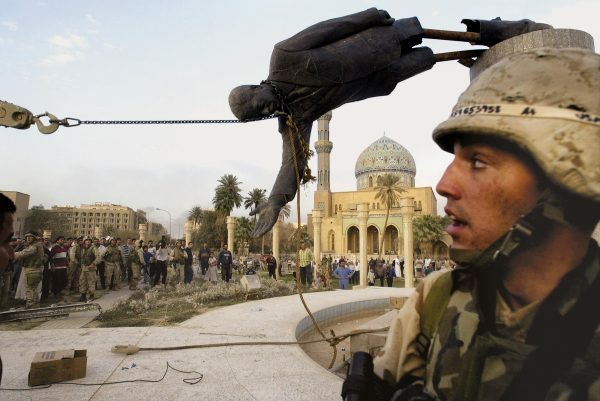 When the United States invaded Iraq in 2003 to overthrow Saddam, photos of his statues being toppled by troops defined the moment symbolically. The U.S.-led military coalition quickly launched a radical and sweeping effort to “de-Baathify” the country by purging the government and its bureaucracy of former Baathist members and erasing the cultural and architectural remnants of the selective historical memory that Saddam had fabricated. But merely removing the former symbols did not help Iraq forge a new national identity or unity, and in fact left something of a vacuum in that respect. Like Saddam’s memorials, Confederate monuments may no longer be acceptable as public historical symbols, but they nonetheless retain a distinct and indelible value as historical artifacts. Placed in museums, with appropriate contextualization, Confederate statuary might even succeed in persuading whites that they don’t belong on public property while convincing blacks that they should not be destroyed. An exemplary effort to properly contextualize such a monument can be found on the campus at the University of Mississippi, where a tablet has been affixed at the foot of a statue of a Confederate soldiers. While respectful of the idea of honoring “the sacrifice of local Confederate soldiers,” the tablet also cautions that such monuments “were often used to promote an ideology known as the ‘the Lost Cause,’ which claimed that the Confederacy had been established to defend states’ rights and that slavery was not the principal cause of the Civil War.” In addition to a reminder that the Confederacy’s defeat “meant freedom for millions of people,” the plaque also notes this particular monument’s enduringly divisive legacy as “a rallying point for opponents of integration” on the evening of the deadly riot that marked James Meredith’s arrival on campus in September 1962. Modest as it might seem, this effort might be a step toward the day when white and black Southerners not only find a way to share their common but traditionally conflict-ridden past, but to make it the foundation of a new and profoundly more representative regional identity. If this should indeed come to pass, the Lost Cause will have given way to one infinitely more inclusive and inspiring. James C. Cobb is the Spalding distinguished professor of history, emeritus, at the University of Georgia in Athens. His most recent book is The South and America Since World War II.